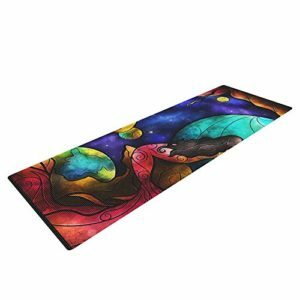 Are you looking for a psychedelic yoga mat? 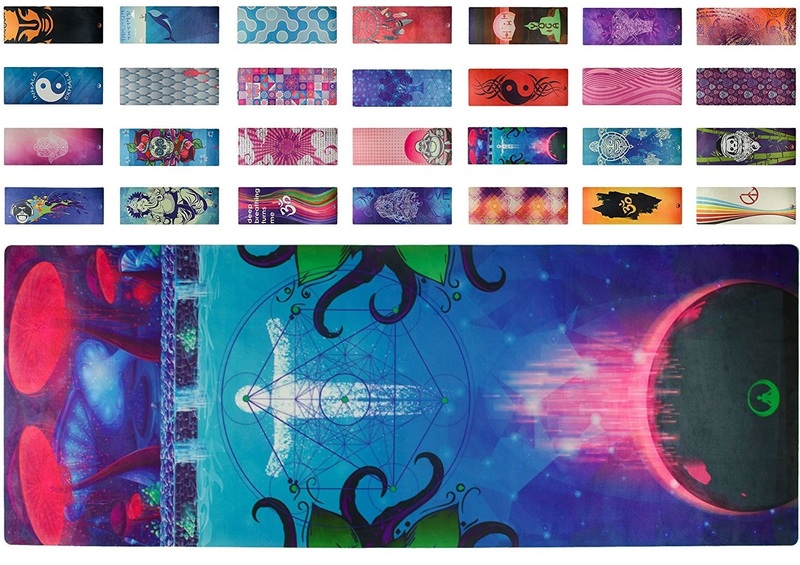 We’ve previously reviewed a collection of pretty yoga mats that included some psychedelic designs from Free Thirty Three, Nirvana, and ToulaFit. 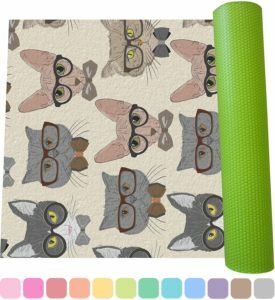 Here we cover a couple new brands with even more awesome yoga mat designs. If you are looking for a psychedelic yoga mat, the first place to start is with Soul Obsession’s Pychedelic Consciousness Yoga Mats (Amazon link). Shown above is the Cosmic State style, as well as samples of their other color options. 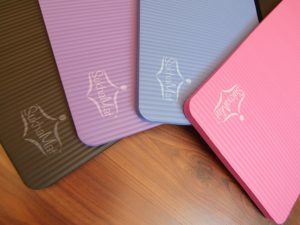 Soul Obsession’s yoga mats are made with a towel-like microfiber top bonded to a lower natural rubber layer in an eco-friendly manufacturing process. The soft microfiber upper layer has two purposes. It absorbs sweat to maintain a good gripping surface. 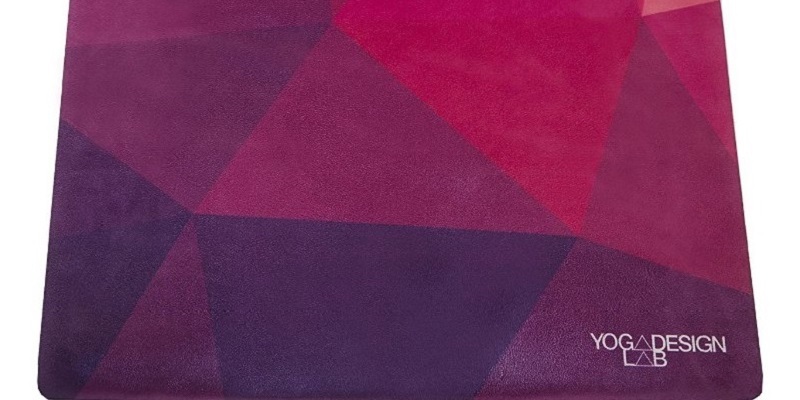 You won’t need a separate yoga towel in standard yoga conditions. 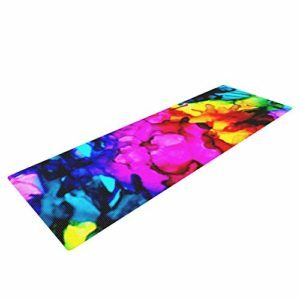 The microfiber surface also retains the water-based inks for creating great psychedelic yoga mat patterns. 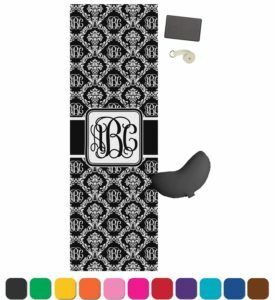 The Soul Obsession yoga mat is 68″ x 24″ and 4mm thick, which is pretty standard for a yoga mat. Overall, it’s a great choice if you want one of their awesome designs. 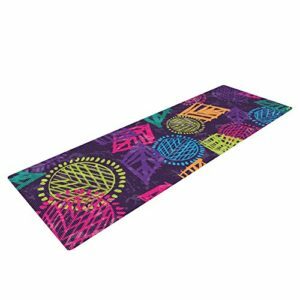 DiaNoche Designs sells a large number of psychedelic yoga mat patterns (Amazon link). Shown above is the Psychedelic Labrador design. These PVC mats are very light despite being slightly larger than average at 72″ x 24″. An orange carrying case is included in the purchase. The DiaNoche Designs are also 6mm thick for extra cushioning. 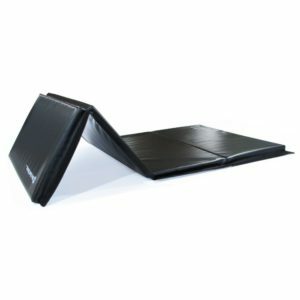 A textured back prevents slipping on hardwood floors, and the upper surface works fine for regular yoga. Note that very harsh chemical cleaning agents will fade the gorgeous designs, so take care when cleaning the mat. 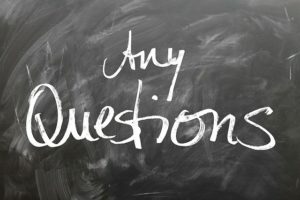 See our article on how to clean yoga mats if you need guidance on gentle yoga mat maintenance. Kess InHouse is a unique brand that focuses on bringing real art to consumer goods. 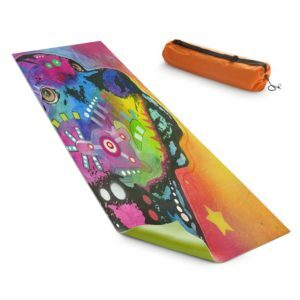 Their psychedelic yoga mat designs come from real artists, and a portion of each sale goes back to the original artist. 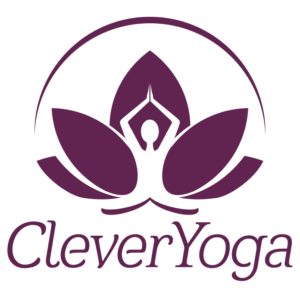 The mats are solid yoga mats with 6mm of foam cushioning and a non-slip back side. 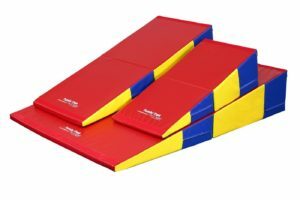 Mats are 72″x24″, which is within the normal size range. 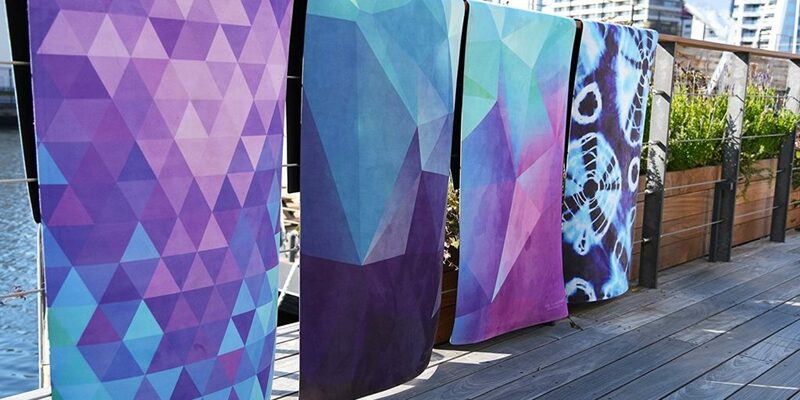 When washing these colorful yoga mats, you should use gentle cleaners. Here are a couple of our favorite artists that focus on vibrant colors and spiritual themes.. Each artist has aywhere from 10-30 different designs, so be sure to click through each artists’ link and check out their full portfolio of psychedelic yoga mat patterns. Mandie Manzano’s Psychedelic Yoga Mats (Amazon link) include the Believe pattern shown above and over 20 other patterns. Mandi Manzano favors strong but moody colors and large bold shapes. Many of her works seem to echo stain glass window styles. Claire Day’s Psychedelic Yoga Mats (Amazon link) include the Sweet Sour pattern shown abvoe. Claire Day also has over 20 other patterns. Her style tends towards abstract shapes in psychedelic rainbow mixes. The patterns remind you of an inkblot personality tests, showing you who you really are deep inside. Emine Ortega’s Psychedelic Yoga Mats (Amazon link) include the African Beat pattern shown above. Emine Ortega is not strictly psychedelic, but uses well defined clean shapes and mixes of eye-popping colors. We would characterize Ortega’s style as a kind of California indie hipster theme.